It is said that the Macy Conferences were the most important meetings of minds for the purpose of understanding control of human behavior. They are also considered as the breeding ground for Cybernetics and breakthroughs in Systems Theory. In essence, they brought “systems thinking” to the awareness of a cross-disciplinary group of intellectuals. 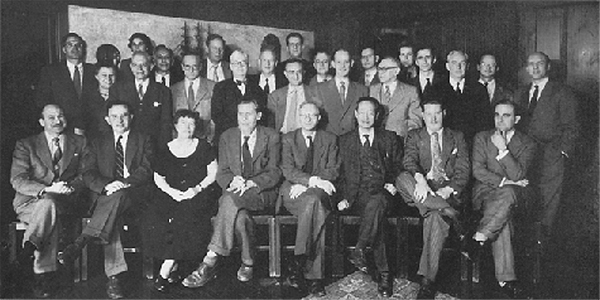 The Macy Conferences were ten meetings of scholars from different academic disciplines held in New York between 1946 and 1953. They were initiated and organised by Warren McCulloch and the Josiah Macy, Jr. Foundation. The main purpose of these meetings was to set the foundations for a general science of the workings of the human mind. An incredible collection of guests attended the Cybernetics Group sessions during their seven years of existence. Among them were Max Horkheimer, the head of the Frankfurt School, and Claude Shannon, “the father of information theory”. See this link for a more complete listing of the attendees and guests. The foundation for the conferences was laid in May 1942, when the key participants met to exchange ideas, which created the enthusiasm and motivation to hold the Macy Conferences a few years later after the war. Attendance for the initial small meeting was by invitation only, and the two topics on the agenda were hypnotism and conditioned reflex. As soon as the war ended, Bateson contacted Fremont-Smith, pushing for some sort of conference to follow up on the concepts from the 1942 meeting. Unfortunately, there is a lack of comprehensive documentation on the Macy Conferences. Part of this derives from the fact that the first five conferences were never formally documented with published proceedings.